Brief Description of Subject: Christ’s triumphant resurrection. A solider sinks to his right in fear while a angel is shown who rolled away the stone from his tomb. The city of Jerusalem and Mt. Calvary with the three empty crosses can be seen in the background. The lilies near the tomb are the traditional symbol for Easter. The bottom panels are symbols of the events from the Old and New Testament that tell the story of the fall into sin to the Restoration of Fellowship with God. 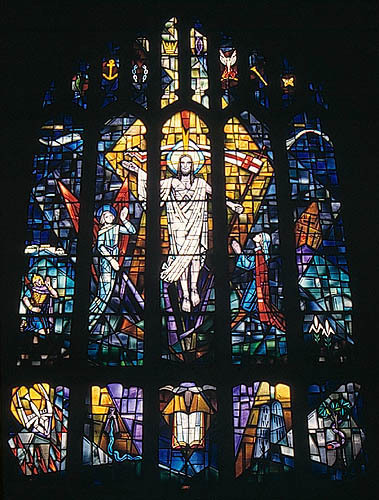 The upper panels are symbols referring to the Resurrection and life eternal.